The Best of RISK! 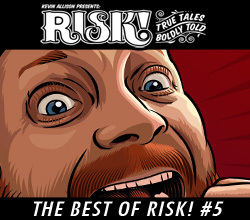 #5 | Kevin Allison Presents: RISK! Live Show & Podcast! Wanna hear out more of our favorites? Check out The Best of RISK! #1, #2, #3, #4, #6, #7, #8, #9, #10, #11, #12, #13, and #14! Ed Gavagan consistently blows me away! What is the name of the song running in the Gnome Fondler story? The Snow White Hi Ho with house music behind it? Yes! It’s been a long time since anybody has done a deecnt quirky criminal caper. In fact the last one worthy of note was probably In Bruge so I have high hopes for Seven Psychopaths . That was something I assembled with a song by Evolent (downloadable here: http://phlow.de/366daysofmusic/052 ) and the Hi-Ho song from Disney’s classic Snow White. Thanks for listening! Does anyone know the story of this woman who wanted her appartement cleaned so put an add on craigslist for it? I heard in 2014 so it was for sure a podcast from before that date. Heard it off a friend’s phone so I have no idea what it’s called.